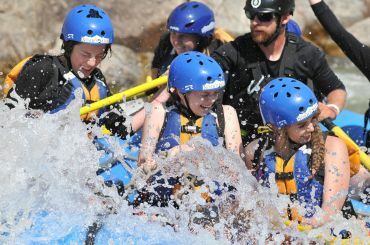 Our most popular package combining the Browns Canyon Adventure Park with Colorado's #1 whitewater rafting trip! 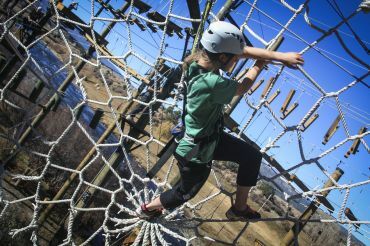 Start your day with 2.5 hours of fun on the most innovative high ropes challenge course in Colorado: the Browns Canyon Adventure Park. 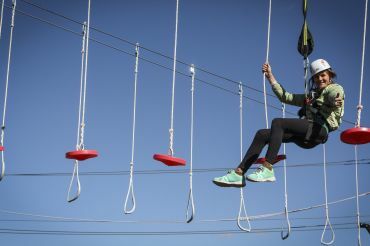 The Park offers 4 Courses with 66 Elements and 2 Adrenaline Features, including zip lines, high rope bridges, and a giant swing! Courses range from introductory level elements to "blue" and "black" features designed to test the most intrepid adventurer. You can pick the level of challenge that is perfect for you. Take a break from the action and enjoy a delicious cookout style lunch at our lodge. Then spend the afternoon rafting through 10 miles of Colorado’s Arkansas River through Browns Canyon National Monument, Colorado's most popular section of whitewater. Experience the fun and excitement of rafting several Class II-III+ whitewater rapids such as Pinball, Zoom Flume, and Raft Ripper. For the Adventure Park: Closed toe shoes, athletic clothing, long pants or longer shorts. No loose items or jewelry. For the Raft Trip: Quick-dry clothing (no cotton). Closed toe shoes or sandals appropriate for river activity (no Crocs or flip-flops). Rental gear is available at the front desk.